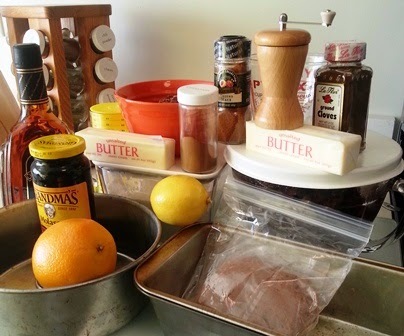 Preparing to make a fruitcake today. As many of my readers know, I am not a fruitcake maker, or even a baker, in general. However, I recognize that the homemade ones are usually the most delicious. Because of this, I always intended to make a fruitcake this year. My friends are having their annual fruitcake tasting right after Thanksgiving, which is why I might be starting a bit earlier than some. I did purchase a Neiman-Marcus fruitcake, which is on back order (how could I resist? this is, after all Mondo Fruitcake), and might consider the purchase of a couple more, but mostly I’m focused on this one. When I make something, I tend to start with something traditional or time-tested as a baseline before moving onto variations—for example, I almost always follow a recipe to the letter the first time. So for this fruitcake, I haven’t selected any fancy recipe, but rather the Dark Fruitcake recipe out of my Joy of Cooking cookbook (the 1997 publication, which I believe was skewered by some because it also contained fancy/exotic recipes, but I love it to death—it’s my Bible when it comes to cooking). This gosh-dern fruitcake. I’m sure anyone who has made one will agree with me that it's a freakin’ scavenger hunt to assemble all the ingredients needed. My friend Laura graciously stepped up to be the candied fruit coordinator for three of the fruitcake bakers for aforementioned party, and purchased, received, and stickily sorted all of the candied fruit: lemon and orange peel, citron, pineapple, and Morello cherries (from Market Hall Foods). They are very nice quality and I'm sure that will reflect well on this fruitcake. I started all the fruit out with a red wine soak last night. This is what the makers of my favorite fruitcake do. Today’s the day to put it all together and get it baked. I’ll report back soon! How did the fruitcake turn out? I've never made one, but my grandmother and great aunt used to...and it was almost a "chore" to get it done! Hi Michelle, The fruitcakes are currently soaking in brandy, and we'll be trying them this Friday, so you'll definitely learn how they turned out! I have never tried that harvest cake, nor the marzipan fruitcake--I don't think I've purchased anything from the Vermont Country store yet. But what a cornucopia of fruitcakes! Thanks for pointing it out--that British fruitcake looks lovely!